Some years ago Henschhausen was an independent village, but nowadays it is as a quarter part of the little town of Bacharach. It is situated on a plateau high over the town, with a fantastic view at the valley of the river Rhine. The Lindenhof is embedded between meadows, fields and its own vineyards. It is a mixed agricultural business with all the typical animals, as cows, goats, pigs, ducks and chickens etc., that belong on a farm and with which you and your children will be pleased to get a better acquintance. Live on a farm is exciting and full of surprices. Children feel themselves as in paradise and they discover with all their organs of sence the fascinating many-sidedness of the nature. With us they can have lots of fun on helping by feeding and looking after the animals and by doing many other small jobs. But not only the children can enjoy themselves very good, also for the adults, and expecially those which are living and working in the big cities, the country-live is relaxing on offering space and rest. Live on a farm is also very teacheble. Every new day townsfolk discover new interesting and unexpected new things.Our farmyard has its own small horseriding center with stables, all equipment and an inside and outside manege. We have horses to suit all abilities of rider. They are well mannered and experienced and very surefooted. 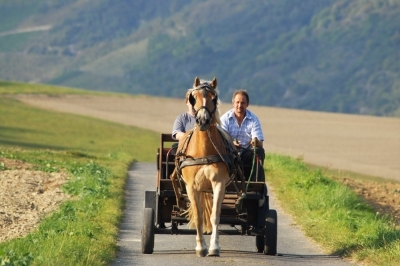 If you can walk, trot, canter and gallop with confidence, or even if you cannot ride, we have the horse and holiday for you.On enquiry we shall be pleased to give you our conditions for trails, prices of stables for horses that our quest bring with them, for riding with horse drawn carriages etc. We offer horse-riding lessons by experienced instructors for beginners, as well as an unique program therapeutucal riding.